Krista here! I’m SO EXCITED to host the fabulous Pepper Basham today! Not only is she an amazing friend and writing pal, she’s also an AMAZING author of Christian Romance. 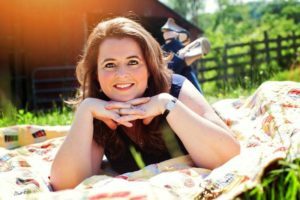 Her newest book, My Heart Belongs in the Blue Ridge Mountains, released last month, so I invited her here today to talk a little about her book and some background on it! As readers, we all get that. The power to inspire our imaginations, to ignite our emotions, to send our world into a post-book haze for a week trying to navigate the foggy line between fiction and reality. I’ve loved getting to live on both sides of that fog – as author and reader, but something unexpected happened when I began the process of writing my newest book, My Heart Belongs in the Blue Ridge. Laurel’s Dream, the last book in Barbour’s My Heart Belongs series, started as a way to “fictionalize” some stories from my family history and turned into a celebration of a culture, people, and era I love so much. In some ways, Laurel, is based on my Granny Spencer – a woman whose very presence shaped my life and faith so much, but she’s also the first person who ever called me a writer. Her love for story came through orally, as so many stories are passed down in Appalachia, and her influence is sprinkled on almost every page of this novel…and a whole lot in Laurel McAdams. I didn’t expect the creation of this book to impact my heart so much, but getting to dig into my Appalachian culture and history, and then bring it to life on the page helped me appreciate the beauties of my culture, but also realize how much strength it took to see beyond the mountains to dreams of the heart. I hadn’t thought about that…but, in part, she RIGHT! Creating this story became an act of love to people, memories, and a culture I grew to love through the stories I heard growing up and the life I lived among a big, Appalachian family. Appalachia is known mostly by stereotypes, but over the past few years, those stereotypes have been changing because of a resurgence of interest in Appalachia. Characteristics of alcoholism, lazy people, wide-spread meth use, filth, and unintelligence, although based on a very small population of the Appalachian culture, is giving way to the discovery of a creative, industrious, imaginative, protective, ‘zest for life’ people group who love home, family, and music. All these elements are blended together to bring my hero and heroine together. He’s searching for a place to belong and finds a way to fit in a very foreign world to him. She’s longing to make a dream come true and finds someone who will help her dream beyond all she’s ever known. I guess it is a love story to my mountains, to a way of life that has shaped me, to the fierce love of a family who encouraged me to dream as big as the mountains, and to a God who forged an appreciation and delight in seeing His handprints throughout the good and bad patterns of a broken and beautiful family history. 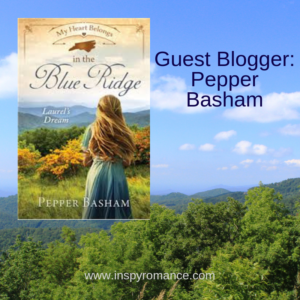 Pepper Basham is an award-winning author who writes romance peppered with grace and humor with southern Appalachian flair. Both her historical and contemporary novels have garnered recognition in the Grace Awards, RT Awards, Inspys, and ACFW Carol Awards. Her most recent historical romance, My Heart Belongs in the Blue Ridge, showcases her Appalachian heritage and family history, as well as her love for humor and family. She currently resides in the lovely mountains of Asheville, NC where she is the mom of five great kids, a speech-language pathologist to about fifty more, and a lover of chocolate, jazz, hats, and Jesus. Thanks so much for sharing your story, Pepper! Have a question for Pepper or about her book? Please comment below! Pepper has also graciously agreed to give away a copy of her book (ebook or paperback, reader’s choice) to one lucky commenter! So comment with a question to enter!! A part of the world I would like to know more about. This sounds like such a wonderful read. It’s a beautiful part of the world! I loved getting to celebrate it, Mary. Hi Krista and Pepper. Thanks for sharing some of your background and story inspiration Pepper. I love that your family history and heritage influences your writing. What better way to celebrate something special? I think those special places and people become part of us so it is hard not to be impacted by them. Totally agree!! It was very special to celebrate those people and stories this way! Good morning, Krista and Pepper! Thank you for sharing your story with us! My grandmother was a huge influence on me as well, so I love that you have honored yours in this story! Paula, isn’t it wonderful to have such a legacy as a friendship with our grandmothers!! She was one of my best friends as I became an adult. Always fun when a story is set in the Appalachia Mountains. Hi Krista! Thanks Pepper for sharing your inspirational story about your grandmother. You live in a beautiful part of the country, Asheville, North Carolina. I was able to visit a family friend, the area, and the Blue Ridge Parkway in May of 2015. Since we have friends and family in Kentucky and Eastern Tennessee, the Smokey Mountains and National Park is a favorite vacation destination. I chuckled when I read your stereotypes about Appalachia. My first introduction to the Appalachia Mountains was by reading Katherine Marshall’s novel Christy (1967). My heart belongs to the Smokey Mountains with its windy streets, lush foliage and rippling brooks. Best wishes and Happy Monday. Thanks so much!!! Yes, this part of the world is beautiful. The Smokies are in my ‘back yard’ so to speak. So glad you get to visit often!! Catherine Marshall’s book, Christy, was such a treat to read – and I’ve had several readers compare this book to her classic tale. What an honor! It’s a nice sunny day in GA! I have this book at the TOP of my want list. I have read most of Pepper’s books and loved them! So glad for the sunshine today, aren’t you? Good day to you! I would like to know what brings you joy? Sounds like a good book! I’ve read a couple other of Pepper’s books, and enjoyed them. I’ve never yet gotten to visit that part of the US, so it’s fun to visit via books. Thank you for sharing some of the background of this story. It sounds great. I have read most of the books in this series and have loved them. This one sounds just as good. Thanks for writing about Appalachial I enjoy reading about it. I’ve visited the mountains in Harper’s Ferry as well as in Georgia . How different are the mountains in Asheville, NC from the ones farther north? What was the first story you heard that was past down orally from generation to generation. Thanks for answering my question and entering me into your giveaway. I will be looking forward to your future book. Our church library is 75 years young and we have books for all ages. I work in the library and have for 40 years. If I win, this book will be given to the library so that others may enjoy it too. I’ve read most of Pepper’s contemporary books and love them. I haven’t yet read any of her historicals. I’m wondering if she prefers writing one more than the other: historical or contemporary? Thanks for sharing the history behind the book–that is wonderful that it is a fictionalized version from some of your family’s stories!!! How cool is that?! I can’t wait to read this! :) My question for Pepper is: Does writing contemporary fiction or historical fiction come easier to you? I noticed that you write both which is super-fun, but I have only had the chance to read some of your contemporary fiction books. Looking forward to digging into the historical ones too! I would love to win a paperback copy of MHBBR-Laurel’s Dream. I don’t usually read contemporary books but Pepper’scare an exception. I love her historicals, too! She is a keeper! Which genre do you like to write better…….historical or contemporary? My Heart Belongs in the Blue Ridge was so outstanding! I swear, I’m still swooning over the ending. My favorite new book of 2019 so far…don’t miss this one!